SUPPLYING TOOLS FOR EVERY ENGINEERING APPLICATION. As a specialist in springs, shim, key steel and cutting tools, we're proud to carry an extensive range of Century Springs, Shop Aid and Dormer products. Fisher Lamco is well known in the engineering industry for the supply of quality tools and industrial products. From our beginnings as a prominent supplier in the belting industry in the 1950s, Laminated Belt & Industrial Supplies had branches in Sydney and Newcastle. As well as belting the company supplied manufacturing and engineering companies with a large range of tooling and machine tools. With the amalgamation of DW Fisher Pty Ltd and Laminated Belt & Industrial Supplies Pty Ltd in 1980 the company now known as FISHER LAMCO PTY LTD was born. Over the years a change in direction saw the belting sector of the company overtaken by the supply of Metalworking tools and Industrial supplies to cater for the toolmaking and engineering industry. As a specialist in springs, shim, key steel and cutting tools, we’re proud to carry an extensive range of Century Springs, Mak-a-key, Shop Aid and Dormer products. With over 80 years experience in the industry, the Fisher Lamco team is a group of dedicated people ready to help you with your engineering problems. 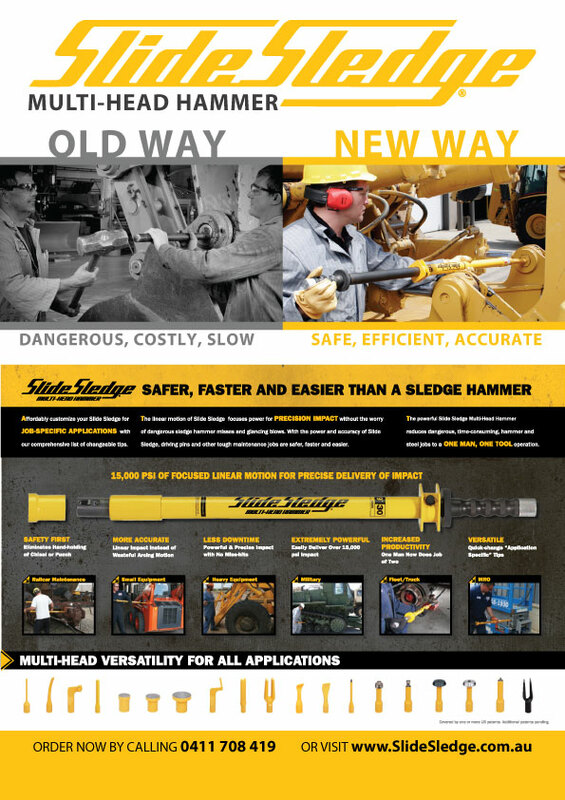 Slide Sledge is dedicated to bringing safety and efficiency to the workplace. Our revolutionary hammers utilize patented sliding technology that gives users a single-user hammer for jobs traditionally performed by two people. The linear motion of Slide Sledge focuses power for precision impact without worry of dangerous sledgehammer misses and glancing blows. 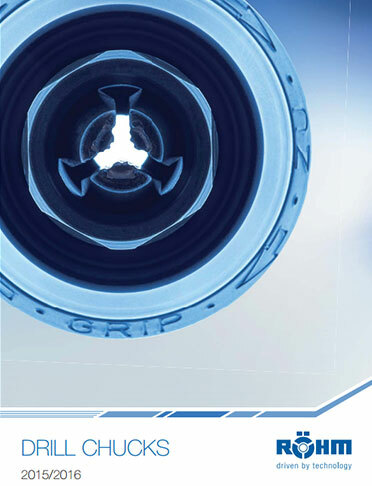 With the power and accuracy of Slide Sledge, driving pins and other tough maintenance jobs are safer, faster and easier. We have three different categories of hammers: the yellow Multi-Head Hammers, the blue Pull Hammer and the red Precision Hammer. We give a breakdown on our website of various uses for each of these hammers; this should give you a better idea of which hammer is right for you. With over 4500 sizes of springs in stock and available for immediate delivery we offer the best spring solution available in Australia. 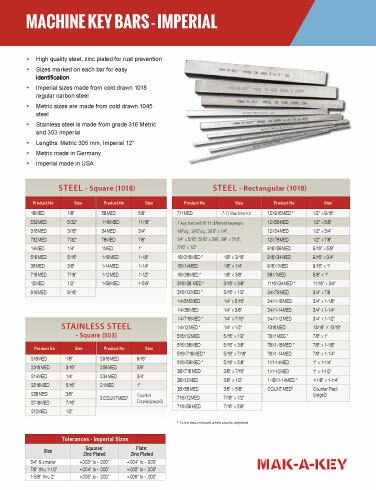 Stock includes compression and extension springs, spring steel and stainless steel, plated and unplated. Other materials and coatings are available on request. We also offer a manufacturing facility for high quality custom made springs to your requirements. Simply supply a drawing or sample and we can provide you with pricing for one spring or one million springs. 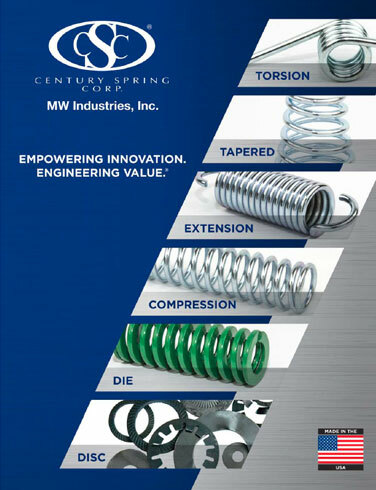 If you do not have a sample or a drawing our trained staff will assist in designing the right spring for your application. We can offer excellent lead times of 7-10 days for standard orders and 1-2 days for those urgent orders. As the market leader in key stock, Fisher Lamco is proud to distribute MAK‑A‑KEY. MAK‑A‑KEY is the oldest and most well known key stock brand in the world. MAK‑A‑KEY is known for the slogan “Cut, File, and Fit!™” in reference to offering stock material for aftermarket repairs and maintenance of power transmission components. Fisher Lamco has the most extensive inventory of key stock and bar stock in Australia. As a leading purveyor of MAK‑A‑KEY, we not only have the most inventory, but the best brands in the business. 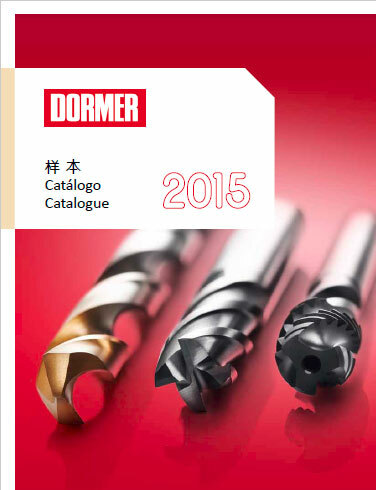 Fisher Lamco have been a dedicated distribution partner of Dormer Tools for many years. Dormer’s core product program is built around a range of tools designed for the general machining industry and encompasses both indexable and rotary drilling, milling, threading and turning tools. As a major international supplier, Dormer insists on its products surpassing all relevant independent performance standards, even in industries such as aerospace where tolerances are stringent. Consider the standards which Dormer’s cutting tool programmes achieve. These include DIN, ISO, BS, ANSI and JIS. If any product fails to meet recognised levels of specification or performance, it simply will not be allowed into the Dormer range. Fisher Lamco has 80 years of industry experience, and the technical knowledge to help you choose the right tool for your job, every time. N.E. Slavin Company founded by Nathaniel Slavin in Boston in 1944 warehoused and sold stainless steel and coil to Massachusetts manufacturers. Today the company is still owned and operated by “Nat “ Slavin’s family and sells metal and plastic products to manufactures in the United States and industrial centers throughout the world and operates as Shop Aid Inc, still based in the Boston area. 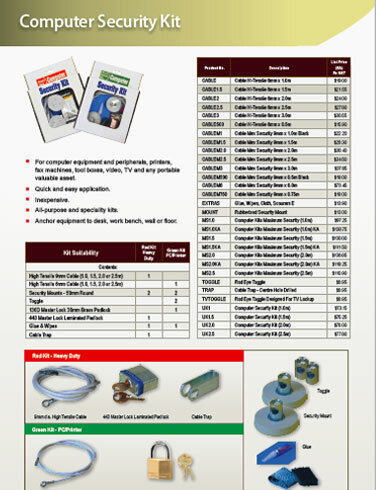 Shop-Aid offer a full range of shim stock including rolls, slotted shims and assortment packs. 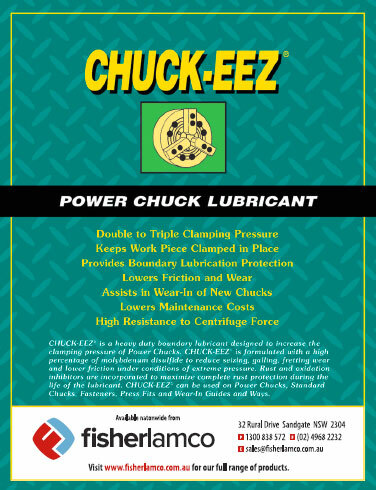 CHUCK-EEZ® is a heavy-duty boundary lubricant specifically designed to increase the clamping pressure of Power Chucks. CHUCK-EEZ® is formulated with a high percentage of molybdenum disulfide to reduce seizing, galling, fretting wear and lower friction under conditions of extreme pressure. 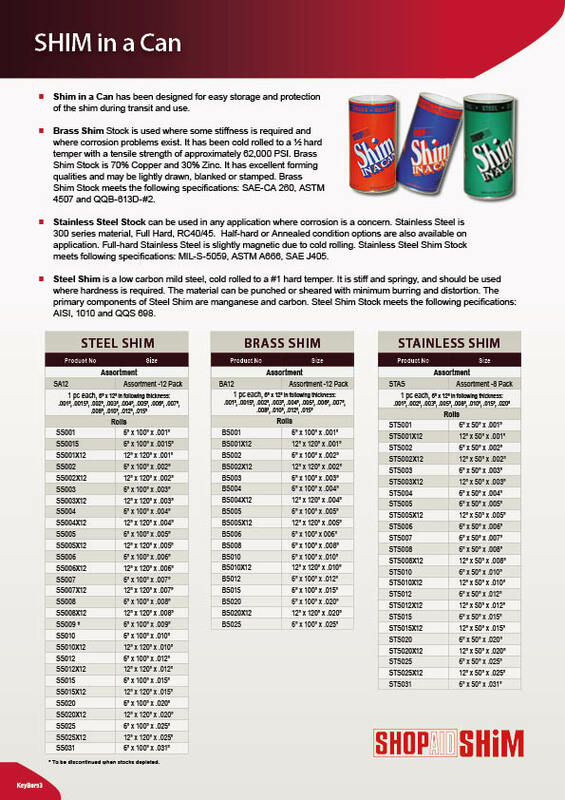 Rust and oxidation inhibitors are incorporated to maximize complete rust protection during the life of the lubricant. It is able to withstand pressures up to 500,000 pounds per square inch, and the tacky nature of the product gives it high resistance to centrifugal force. CHUCK-EEZ® can be used on Power Chucks, Standard Chucks, Fasteners, Press Fits and Wear-In Guides and Ways. With all the benefits, it’s easy to understand why CHUCK-EEZ® is the best Power Chuck lubricant available today. These gauges make great promotional pieces or even tradeshow giveaways. Get them personalized with your company information. Who could ask for a more useful & unique calling card to leave behind when visiting your customer or potential customer. 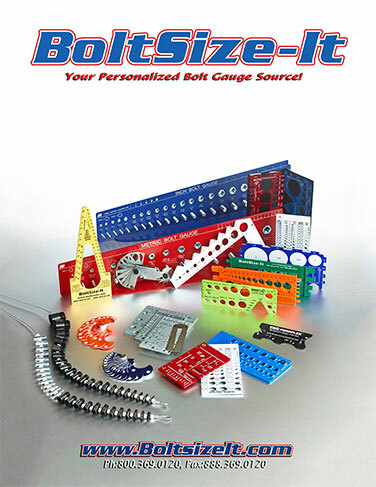 Get bolt gauge, thread pitch gauge, screw gauge and thread gauge at competitive price. Computalock is a specialised locking system for computer equipment and peripherals, printers, fax machines, tools boxes, video, TV and any portable valuable asset. An inexpensive tool with quick and easy application, Computalock allows you to safely anchor your valuables to a desk, work bench, wall or floor. Kits are available to suit all applications. and services, actively expanding into new markets and using innovative production processes and technologies. If you’re interested in an item from the Fisher Lamco range, or are looking for distribution of your product please don’t hesitate to contact us using the form below.